I’m not a fan of resolutions because they often don’t work—my husband tells me every year how crowded his gym gets in January but then empties out each February after people give up on their yearly gym resolution. However, I am a big believer in goal setting and the New Year is a great time to get started. Why set goals? Well, if you do the same thing you’ve always done, you will get the same results. Therefore, this year will look pretty much the same as last year if you don’t change anything, which is great as long as everything is already amazing for you. If not, decide what changes would feel good to you and make those your goals. 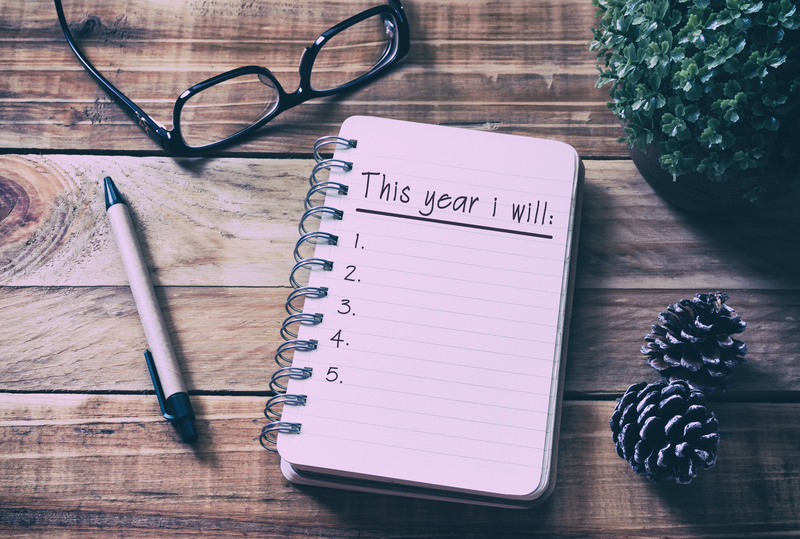 I do an annual goal-setting session with all of my clients at the outset of each year and the following is the basic outline so you can set your own goals in order to make 2019 your best year ever! Begin at the end. Close your eyes and flash forward in your mind to the end of 2019 where you see yourself happy and satisfied with your year. I often use creative visualization with my clients as it helps to quickly clarify what they want out of life. The trick to visualization is to do it until you really feel the emotions of happiness, excitement, well-being, etc. Then evaluate what you just experienced in the visualization by asking “what was different than right now?” In that visualization, are you in a different, more rewarding job? Are you healthier or in better shape? Is your relationship with partner lighter and happier? Did you save more money? Does parenting feel easier and more enjoyable? Did you write that book? You get the idea. Jot down what would make the next year feel amazing to you. Use reverse engineering. After writing down some notes about what you would like to have happen in the next year, work backwards to see where you would need to start now. This can be tricky, especially if the difference between where you would like to be and where you are now feels huge to you. If you want to write a book but have written zero words, then pick the very first step—e.g. decide on a book topic. If you want to save more money, your first step might be exploring savings accounts or investment options. Starting a business and running your own company is a common goal I see with clients, so creating a business plan might be the first step for you before looking for office space, etc. Picturing the end goal and then breaking that down helps to see where to start. Start small. This may seem counter-intuitive to the “go big or go home” thinking that is prevalent in the U.S., but stick with me a minute. Too often, I have clients with a big goal and the amount they have to do to reach that goal can be overwhelming. If you want to get healthier, but your initial goals are “drink 8 glasses of water a day, give up sugar, exercise daily, master yoga, and become a vegetarian,” then you are likely setting yourself up to fail. When we cannot do everything, we often throw up our hands and say “oh well, I tried” and give up (hence the emptier gym in February). It is better to pick one thing until it becomes habit before adding another. If you currently exercise 0-1 time per week, then setting a goal of exercising 2 times per week is a realistic goal where you are setting yourself up to succeed—and then you can increase or add the next goal. Schedule regular check-ins. Too often, people set amazing goals…but then the whole year goes by before they revisit them and are disappointed when they didn’t reach them. Goals take time and energy to reach which is why it’s important to revisit them often. I have most of my clients do weekly assessments of their goals and it does not take much time at all. Schedule 10 minutes on a Sunday and assess where you are. Then decide what small step or steps you need to take the following week and write those down. If you do even 1-2 steps per week, think where you will be at the end of the year compared to doing nothing. Small steps add up to huge accomplishments when done consistently. Do it now. As in, right now. Stop and do one thing related to your goals you just created. Drink that first glass of water, open an online savings account, schedule your two weekly workouts into your planner, make plans for a date night with your spouse. Getting started is always the hardest part, but action begets action. You will feel better the sooner you take that first small step and the next steps become easier to take once you get started. Once you start making progress, the intrinsic motivation kicks in and the excitement level builds until you are well on your way to the amazing year you visualized for yourself. Kristi Helvig is a Ph.D. Licensed Clinical Psychologist and Certified Life Coach who helps clients reach their goals all over the world through the magic of Skype. If you would like more help reaching your goals or would like a free consultation to see if coaching is right for you, please email her at kristi@prosperitycoachingandconsulting.com. Happy 2017! This is Dr. Kristi here, and I know you’ve seen Dr. Todd’s post about goal setting earlier this week, so this is my spin on approaching the new year. I will admit that even as a very upbeat person, the end of 2016 was rough for me on several levels. I attended several funerals for people who died well before their time (ages 39 and 18 respectively), as well as saw the deaths of many of my beloved childhood icons from Prince to Princess Leia. This combined with the political ugliness of election season made me really happy to see the end of 2016. Yet, with every ending comes new beginnings, and I believe that going through emotional pain often causes self-reflection and allows you to view the essence of what is most important to you. For me, that has always been family and career, in that order, and where I will continue to put my energy in the coming year. I’m not a believer in resolutions as they don’t tend to stick for a lot of the same reasons extreme diets don’t work. However, I am a believer in creating goals and then taking small steps each day toward reaching them. At the beginning of each year, I create a goal list and then do some reverse engineering to figure out what steps I need to take, and in what order. One of the great things about hiring a life or career coach is the accountability factor, as there will be days you don’t feel like taking steps. I have awesome (and very honest) clients who sometimes tell me they only took their next step because they knew they had a Skype session with me that week. That’s great, and I’m a firm believer in the notion that ‘slow and steady’ accomplishes a great deal over time. Ask any financial planner about saving for retirement and they’ll tell you the same thing. If I wasn’t married to another psychologist/coach who holds me accountable (but only when I ask him to or we’d have problems), *grins* you can bet I’d hire one too. In terms of my goals for the year, I have a fiction anthology coming out in the Spring, and another completed novel in production now, also for a Spring 2017 release and need to work on a marketing plan for both books. By the end of 2017, I want to have another novel written and ready for production, as well as complete my non-fiction book on career coaching. This means I have to write about 500 words per day, which is very doable. In terms of personal goals, I want to continue a consistent yoga routine as well as increase mindfulness through more meditation as I feel healthier when I do it, and have found more creative ideas flow easily as a result. I use a tracking sheet to mark my progress in all areas each week, and am in love with the Conquer Your Year planner, and will give more updates as I use this throughout the year. Note: I am not receiving any compensation to endorse this planner; I just started using it myself and love, love, love it. I hope that you have a happy, healthy, and prosperous 2017, and that you reach all of your desired goals in life, love, and career. As always, please let me know if you have any questions about coaching, and I’ll be happy to answer them for you.